ARCHANGELS is a company based in God's Country (beautiful sunny Southern California), dealing in Rare and Unique Paper Collectibles. We specialize in vintage Comic Books, Original Comic Book Artwork, Hollywood Movie Posters and other related items as well. We are Senior Advisors to the Overstreet Comic Book Price Guide and a Charter Member Dealer with the Comics Guaranty, LLC (CGC). For other wonderful items, make sure to visit us at our About Me Page. Creepy #15 Art by Neal Adams. 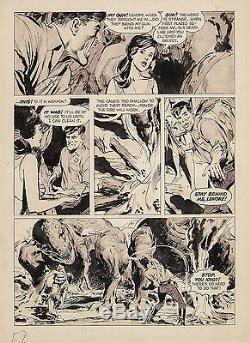 Great action page from Creepy #15 (Warren - June, 1967) by the living legend himself, Neal Adams (pencils and ink wash) for the story, The Terror Beyond Time. This is a key battle scene with a superb 1/3 splash panel as the two time travelers engage in mortal melee to-the-death with, not only one, but two attacking T-Rex's. This is early Adams, at his finest, working for Warren Publishing when he was inking his own pencils and experimenting with various techniques, such as this ink wash, which produced stunning and remarkable results. Finding pages in which Adams inked his own pencils is tough enough, but acquiring such a fabulous ink wash example by this HOF artist is even rarer still. By the way, that cave man in the grip of the T-Rex is toast! The item "Creepy #15 Original Art by Neal Adams Ink Wash with T-Rex Warren" is in sale since Wednesday, February 25, 2015. This item is in the category "Collectibles\Comics\Original Comic Art\Interior Pages". The seller is "water-walker" and is located in San Diego, California. This item can be shipped worldwide.